The popular Virginia Beach event, the holiday lights at the beach is presented by BayPort Credit Union! 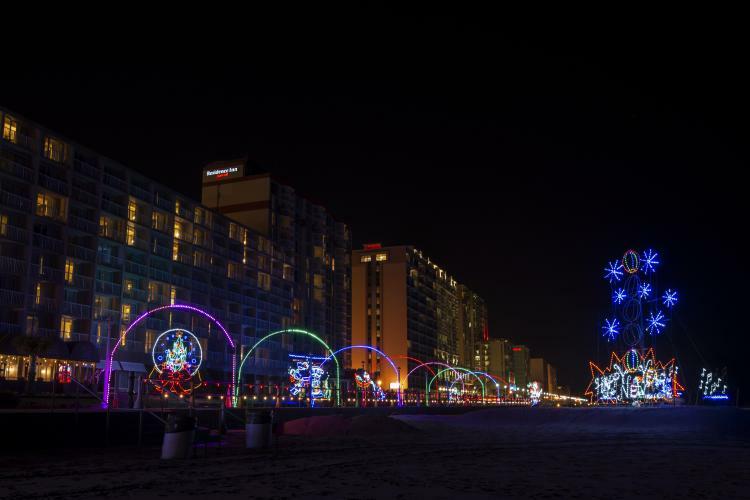 Enjoy twinkling lights with the beautiful Virginia Beach Oceanfront as a backdrop. This is truly a one of a kind experience you will only see in Virginia Beach during the holidays. This is one of the only times that the public is allowed and encouraged to drive on the Virginia Beach Boardwalk! Yes, driving ON the boardwalk is how you will see this festive display of lights. This event begins at 2nd Street on the boardwalk. There's no question why this holiday experience is on so many people's bucket list. At the Holiday Lights at the Beach, you will see an array of lights that show unique animations. See lit shapes of dolphins jumping out of water, amazingly colorful fish, and other marine life all decked out in holiday colors. There will be so many things to see. Elves, Santa, and an extra large Christmas tree all will be present... and we're talking about a HUGE tree. It will stand even taller than the King Neptune Statue! BayPort Credit Union Holiday Lights Merry Mile opens in the evening, beginning at 5:30 pm. The hours of the light display are from 5:30 PM - 10:00 pm Sunday through Thursday. The hours for Friday and Saturday are 5:30 PM - 11:00 pm. This special holiday event accepts cash only. Special pricing for military is on Mondays. Tickets for Miliraty Monday are only $5 per car! Rachel Jones is a writer, photographer, and social media expert. She is a graduate of Old Dominion University. She has been working with VirginiaBeach.com since 2012. There are no related events right now, but check back soon for more!